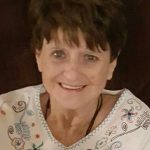 Elaine Louvie Jobe passed away on Wednesday, November 28th 2018 in Granbury, TX at the age of 82. She was born on May 5th, 1936 in Fort Worth, TX to Robert and Lillian Stout. She lived a full life surrounded by her children, grandchildren, great grandchildren, and friends. She loved cooking, travelling, her family, and the Lord. She loved to check for herself in the obituaries and joke that she was doing all right when she didn’t see her name, but she finally made it. She is preceded in death by her husband, Donald Jobe, daughter Sue Franklin, 3 siblings, parents, and many other friends and family. She is survived by 7 children, James Wooley, Theresa Daily, Tim Wooley, Keri Day, Donald Jobe Jr., Ted Jobe, and Willum Jobe, their spouses, and many grandchildren and great grandchildren. Visitation will be held at Wiley Funeral Home Saturday, December 1st from 6-8 PM. Funeral services will be held Sunday at the Granbury Church of God at 2:30 PM. Graveside service following funeral at Holly Hills Cemetery. always admired the relationship between Theresa and Elaine. I am so sorry for you, Theresa, and your family. She was so cute and made me smile the few times I had the pleasure of being around her.